Despite the name, Worthless Boulder has finally become a popular Central Park destination. This guide was originally written in 1988. Fifteen years later, I started transferring the contents of the guide to this site. Obviously, I never finished the job. 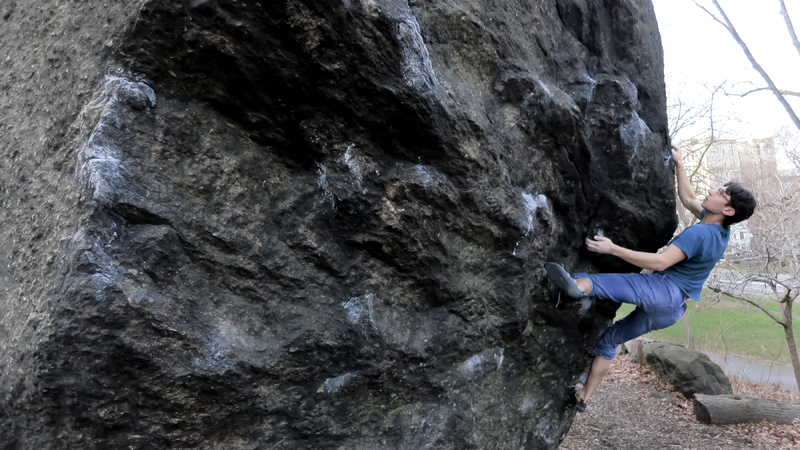 Since then, there has been an explosion of new development in the New York climbing scene. Many of the locations that were referenced at the end of the original guide as being areas that might yield new routes and problems were explored and climbed by a series of climbers over the years. This came about, I think, because of the rise in popularity of bouldering in the late 90s and because Central Park only has so much quality bouldering. And also because the northern reaches of Manhattan became a nice, clean, relatively affordable place to live. 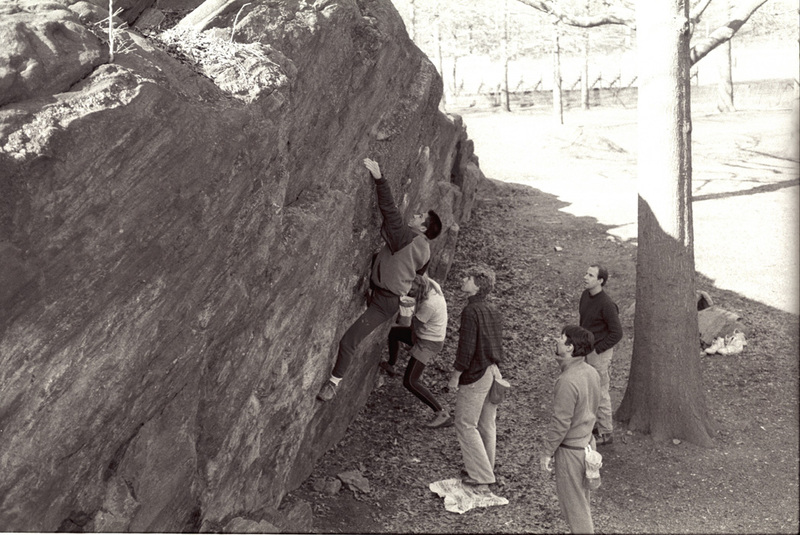 Back in 1988, it was obvious the future of Manhattan bouldering lay well north of 110th Street. Explorations into Inwood Park, Morningside and other areas revealed plenty of rock that had not been developed yet. But for most of us back then, these locations were too far, too dirty, too scary. Bouldering was not an end to itself. It was a way of practicing hard moves, gaining finger strength and balance for the real rock climbing that lay 90 miles to the north in New Paltz. We didn't have crash pads. We didn't have "crews." It was hard enough just convincing one or two friends to walk with me to the Worthless Boulder when I found it sitting chalk-free and forgotten by the side of the road in 1992. I scouted the smaller boulders in the Ramble, hiked underneath the Hepatitis rock, slogged through the rain in Morningside and came back with tales of climbs yet to be. But no one wanted to go. Everyone was working on their Gunks tick list. Or planning road trips to the New River Gorge or Cannon Cliff. No one wanted to follow me to these filth holes just to scratch out tendon-busting tweak monsters. No, back then most local climbers in the city would have rather spent a day driving out of town to go top-roping at Claudius Smith's Den or Ragged Mountain than finding new boulders problems in Manhattan. Hell, back then we had Armonk. Which meant that in 30 minutes you could be sitting at a location with top-ropes on a slew of climbs from 5.8 - 5.12 AND there were boulder problems there. But times changed. And suddenly more climbers had crash pads instead of tri-cams and stoppers. And the remaining natural rock resources in Manhattan finally got their due. And I was not there to see it happen. Recent trips to New York have reminded me of the job I left unfinished. 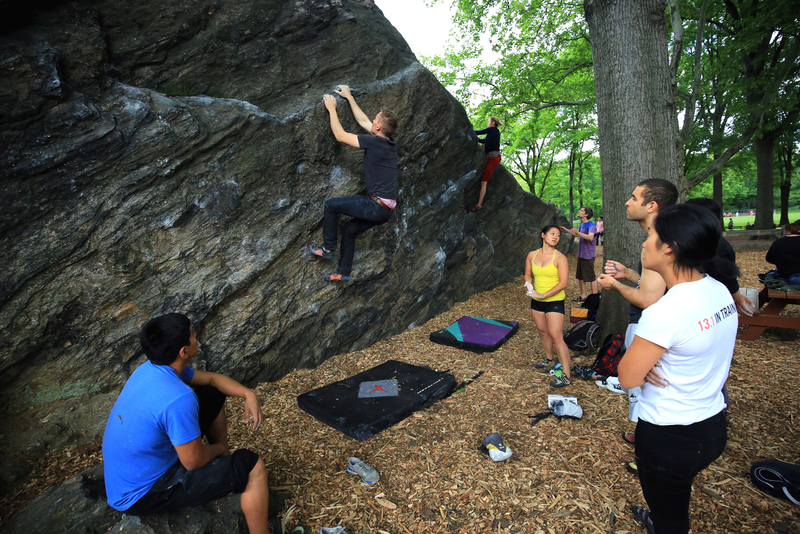 Not the job of chronicling the new bouldering in northern Manhattan. That has fortunately been tackled by climbers with hands on experience. But the job of finally finishing what I had started. Putting the old guide online. Complete. Or as complete as it could have been in 1993 when I left New York for the left coast. I have finally begun that process. In the weeks ahead I will fill in the gaps and finalize the effort of placing the guide online for generations to come. For those looking for the most current information about the newer areas developed in the last 20 years or so, they can comb the internet for the fragmented information or they can check out Gaz Leah's new "New York City Bouldering." A beautiful new guide that does a brilliant job of cataloguing the results of the modern wave of Manhattan bouldering. For those looking for what went down a long, long time ago in a boulder-strewn park far, far away ... you've come to the right place.